Are you as confused about which helmet to buy for an ATV as I was when I set out to answer the question, “What is the BEST ATV helmet?” Seriously, exactly how many terms are there to describe a helmet anyway? It took me a little time to navigate all the terminology and really grasp which features are most important in an ATV/UTV helmet, but I believe I have arrived at an answer as to which adventure helmets are best for riding a four-wheeler ATV or side by side UTV. What Is The Best ATV Helmet? ARAI XD4 Helmet as the best ATV helmet on the market–If you want a helmet that has it all, this is the ATV helmet to choose. 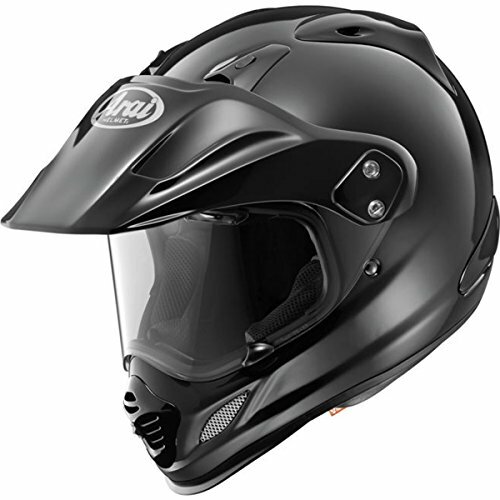 Bell MX-9 Adventure Helmet with MIPS – If you want a moderately priced helmet with a high safety rating choose the Bell MX-9 with MIPS technology. LS2 Pioneer Adventure/Dual-Sport Helmet as the best helmet under $200 – This is your value ATV helmet that doesn’t sacrifice safety or comfort. Scorpion EXO AT-950 is the best modular helmet on the market – If you are looking for versatility choose the Scorpion EXO AT-950. Bell Qualifier DLX Forced-Air helmet – If you enjoy UTV racing, group riding, or spending a lot of time kicking up the dust on a desert UTV trail, the Bell Qualifier DLX forced-air helmet is a great choice for keeping cool air in and dust and debris out. In this comprehensive ATV helmet buying guide, I give you everything you need to make the right decision. I take into consideration the safety and comfort of your ATV helmet, the major types of adventure helmets for ATV/UTV riding, the reasons for choosing dual-sport helmets over other types of adventure or motocross helmets, and I will share which features and specs to consider when buying a four-wheeler helmet or a UTV helmet. Do You Have to Wear a Helmet on an ATV? Can You Wear a Bicycle Helmet on an ATV? What is a Dual-Sport Helmet? How Do You Measure Your Head for an ATV Helmet? Do You Need A Forced-Air Helmet? ATV helmet laws vary by state but it goes without saying regardless of the law that an ATV helmet is necessary if you truly care about your safety. There is no law in the state of Tennessee requiring that you wear a helmet on an ATV trail, however, most ATV trail parks require helmets on their trails. Everyone should wear an ATV helmet regardless of age, experience, type of off road vehicle, or whether you’re riding on the trail or on the road. Check your state laws here and be sure to check the rules for the ATV trail park you are planning to visit. The short answer to this is NO! As previously mentioned, the off road vehicle helmet requirements will vary by state, but it is very likely that only DOT approved helmets will be legal in any given state. There are currently three major ranking systems being used to evaluate the safety of helmets. Snell Certification- This is a private not-for-profit organization which evaluates helmets for motorcycles, auto racing, bicycles, and other protective headgear. Snell requires an extra measure of effort on the part of the helmet manufacturer and represents the best of the best in helmet safety ratings. As I mentioned previously, I decided that a dual-sport helmet is the best helmet to choose for riding an ATV or UTV. Before I dive into why I chose the dual-sport helmet, let’s look at the different types of helmets and their features. Full Face Helmet- This is your typical and most commonly seen type of motorcycle helmet. It has a chin bar and visor for visitibly and covers the entire head and face. For the purposes of ATV riding, I found the ventilation and features of the motocross or dual-sport to be better suited for ATV/UTV riding. ¾ Open Face Helmet- Just as the name implies, these helmets have an open face and cover ¾ of your head. They can be paired with goggles and offer more ventilation and make communication with passengers in your ATV a bit easier, but unless you are planning to ride your ATV on a dirtless, dustless road, at a going to church grandma speed, I would choose another helmet. Half-helmet- These are here for completeness sake, but these minimal vintage throwback helmets offer little in terms of safety and I don’t recommend them. Dirt Bike/Motocross Helmets paired with Goggles- Dirt bike helmets or motocross helmets are often a great choice for ATV/UTV riding. In fact, I am pictured here wearing my GMAX motocross helmet paired with goggles and it works. It is certainly one of the most economical options and can also be a safe option. However, after researching for this ATV buying guide, I am convinced that this combo doesn’t quite meet the criteria for the “best ATV helmet”. My reasoning has mostly to do with comfort and versatility. I find the goggles to be quite uncomfortable after a while on the trail and wearing them with sunglasses even more of a challenge. So while this combination will work and is a very economical choice, I’m requesting a dual-sport helmet on my Christmas/birthday list! 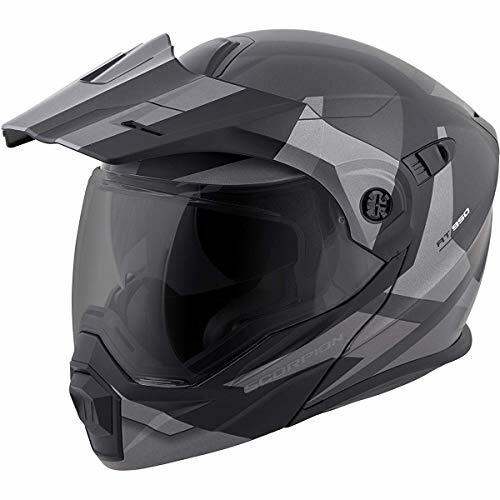 Dual-Sport Adventure Helmets with full face shields and visors– These last three categories would all be great choices for an ATV/UTV helmet. The dual-sport adventure helmet market has traditionally been what motocross and street bike owners choose if they don’t want to buy a different helmet for each sport, ergo, DUAL-sport. These helmets can be worn on the motocross dirt track AND on the street for touring. Since ATV/UTV specific helmets are just now beginning to be created, these Adventure helmets have filled the gap. They offer the safety and comfort of a motocross helmet, but extend the comfort and versatility by replacing the need for goggles with the flip down visors and sun shields. Many of the dual-sport helmets we reviewed also offer incredibly advanced features in terms of the lining of the helmets, the ability to integrate with bluetooth communication systems, and anti-fogging technologies. We will review all these in further detail below. Modular Helmets- Modular helmets are another great adventure helmet option for the ATV rider. In fact, I am torn between which of these final three ATV helmet categories is my favorite. The modular helmet offers the best of both worlds. You still have the features of the dual-sport helmet such as the flip down visors with multiple d-tents and shields eliminating the need for goggles, but you also now have the ability to raise the chin bar and full face portion of the helmet to ease in communication and air ventilation. (And you also look really cool too, Transformers anyone?) A modular adventure helmet offers the safety of a full face dual-sport or motocross helmet while riding at high speeds, but the comfort and communication versatility of the ¾ open face helmet when needed. Forced Air Helmets– Finally, these are definitely the coolest helmets I have ever seen. We have now graduated from a Transformer to a full on Darth Vader breathing system! You and your off road vehicle are one!! In fact, these forced air helmets are considered the first truly SxS UTV designated helmets on the market. Essentially, you now have the ability to install a clean forced air system that keeps fresh air flowing into the helmet while keeping dust and debris out. Combine this with the premium dust skirt and there is no trail too sandy to tackle. These amazing helmets actually have an amazingly reasonable price point given their features coming in at just over $300. Now, that we have reviewed the types of ATV/UTV helmets available and have chosen to go with the Dual-sport category, there are a few other questions to answer before purchasing your new ATV/UTV helmet. Namely, how in the world do you know what size helmet you need? While there is no standard sizing among manufacturers, most of them offer a sizing chart. If you follow the procedure listed below to measure your head and then check the specific manufacturer sizing chart, you should be okay. Use a tailor’s or sewing measuring tape and measure the circumference of your head from 1/2” above your eyebrow around to the fullest part of your skull. This is easier if you have someone help you. Most sizing charts are in inches, but you may wish to record your measurement in both centimeters and inches to be sure you have the measurement you need. The helmet should fit SNUG! If the helmet easily glides on with little force, it is likely too big. If the helmet goes on too easily, it may well come off just as easily in the event of an accident or blunt force. The fit you are checking is the fit on your head (not your face). The cheek pads will contour to your face over time and some helmets even offer peel aways to aid in this, but we are most concerned with the fit of your head! There should be no slippage. Once you choose the size of helmet and receive your new helmet, perform these steps to ensure a good fit. Tighten your chin strap and gently lift upward on the helmet or turn your head from side to side. There should be NO PLAY. If so, it is TOO BIG. Next, grab the back of your helmet and try to lift it forward. You should be UNABLE to lift your helmet off of your head in this manner. Finally, check to see if you can slip your fingers underneath the front of your helmet along your forehead. If so, then the helmet is TOO BIG. Again, the helmet must fit SNUG to ensure maximum safety. Leave the helmet on for a few minutes to ensure there are no uncomfortable spots that worsen over time. Finally, we arrive at the best part of this ATV buying guide: The Best ATV Helmet Brands! I have kept it no secret which helmets I found to be the best based on features and reviews, but now I will give you a detailed explanation of those features on the specific ATV/UTV helmets I chose. This is truly the BEST ATV ADVENTURE HELMET on the market! Hands down there is no question among ATV/UTV and motocross enthusiasts that the ARAI XD4 is the best of the best in terms of fit, safety, and features. Just get a load of all these amazing features yourself. DOT/ECE and SNELL RATED proving it passes the most rigorous of examinations for safety. R75 Radius: The helmet is designed with what ARAI calls it’s R75 Radius which means that there is a continuous 75 mm radius to the helmet which allows for a more safe shape a no snagging in the event of a crash. Break away vents in the event of an accident further make this helmet an extremely safe option. True to size: Be sure to use the sizing guide. Adjustable, however, there is no way to lock into place so high speeds may push the visor back. Removable, Antimicrobial, and Washable liner. The ARAI XD-4 is manufactured by the Japanese company that gave us the very 1st Dual Sport/Adventure helmet on the market. Their helmets are extremely safe and extremely comfortable. Our #2 dual-sport helmet choice comes in at a dramatically lower price point than the ARAI XD-4, but that doesn’t mean it’s dramatically lower in quality. Bell helmets have been around since Fred Flintstone (well not quite, but you get my point) and they are known for quality, comfort, and safety. This helmet is no exception. Eyebrow ventilation, but not closable. MIPS LINER: MULTI-DIRECTIONAL IMPACT PROTECTION SYSTEM- this allows the head to slip in a crash which disperses energy and improves safety in the event of a crash. 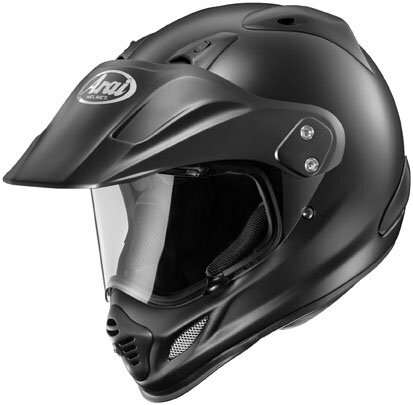 The Bell MX-9 Adventure helmet with MIPS is an excellent choice for your ATV helmet and is a nice moderate price. 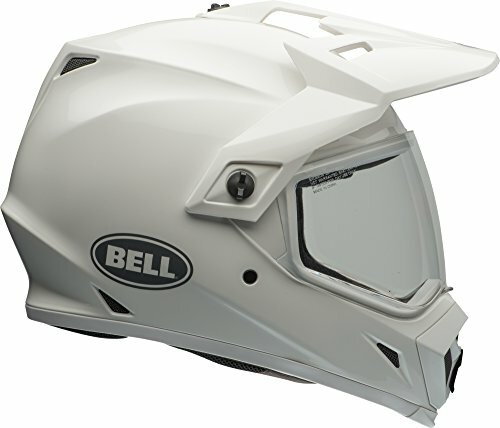 Take note if you want to save a bit more, you can purchase the Bell MX-9 without the MIPS liner which drops the price point down below $200 but doesn’t decrease the safety ratings. That makes the Bell MX-9 a great ATV helmet under $200 option. The LS2 Pioneer Adventure helmet is the most economical helmet on our list coming in at just under $150 this helmet might be a good choice if you are interested in a full face dual-sport helmet, but just can’t bring yourself to pay the price. The LS2 price point is very comparable to purchasing a standard motosport helmet plus goggles and should be given serious consideration. The LS2 Pioneer Adventure helmet may be lacking in some of the extras, but it has all the essentials for a good ATV/UTV helmet, it is DOT/ECE safety certified, it can be used with goggles in addition to the full face shield, and it has a great price making it a solid choice. The Scorpion EXO AT-950 is more often known as a street helmet, but the features make it very appealing as an ATV/UTV option and the price point puts it in as a moderate contender. The flip up option on the chin bar makes this helmet very appealing as there is no need to remove the helmet when you need refreshment, want to get a little more airflow, or just want to talk to your passenger. 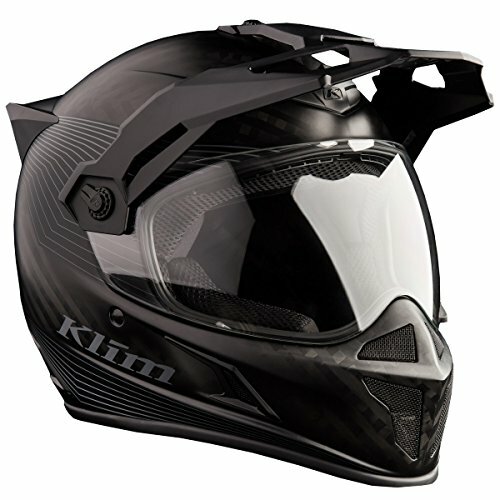 Klīm uses a hand laid carbon fiber wrap and innovative construction to bring this helmet in at just over 3 pounds for a medium. That is a huge selling point for this well build adventure helmet. Medium to oval head shape with a longer oval finding this helmet may be a bit too uncomfortable. Be sure to measure your head and use the sizing chart for a good fit. In September of 2018, Bell Helmets, known for pioneering the way in protective headgear for 65 years, entered into the designated UTV helmet market with the Bell DLX Qualifier Forced Air helmet. I felt that it was at least worth mentioning this newly released helmet in this ATV helmet buying guide, but since it is truly a dedicated SxS UTV helmet, a full review would be beyond the scope of this article. The basic concept for the helmet comes from the racing industry. Utilizing a clean air kit system attached to a snorkel located on the top of the helmet, cool air is forced into the helmet. Combine this with an attached dust skirt and you have the makings of a near perfect set up for the convoy riding racer on the desert dune. The helmet comes in at around $320 on Amazon with additional costs for the forced air system and the dust skirt.